No this is not an April Fools joke. 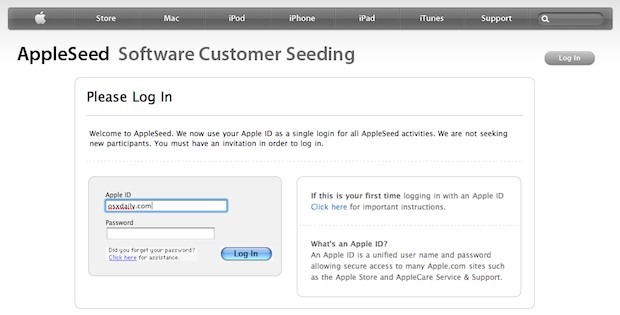 Select Apple customers are being sent email invitations to sign up to be testers for Mac OS X 10.7 Lion. No developer account is required, but you’ll have full access to the current developer releases of Lion. Free access to Mac OS X Lion sounds almost to good to be true, so what does Apple want in return? Other than your confidentiality, they want users to actively participate in the program by using Lion on a regular basis, providing feedback, and filing bug and crash reports when they occur. Obviously the goal is to expand the end-user testing beyond just Mac developers. Fittingly, the program is called AppleSeed, and if you were lucky enough to get an invite, you just login, sign your confidentiality agreement, and then you can go about downloading Mac OS X Lion Developer Preview 2. If you’re going to sign up, you might want to consider installing Mac OS X Lion on a separate partition so you can maintain your existing Snow Leopard installation. If you didn’t get an invite from Apple, there’s currently no way to opt into the program, but you can always sign up to be a Mac developer and download Lion through there. Spotify Comes to the USA – Enter to Win a Spotify Invite in our Twitter Giveaway! where did they say less options!? I﻿ think their simply making the GUI a bit prettier, makes the desktop OS look gay in a sense, but their not really taking any functionality out. You can do just about the same as before, only now things respond to your figure gestures and bounce around a bit. A bit childish maybe, but not less option oriented. « Patent Hints Virtual Desktops & Spaces Coming to iPad & iOS… or a Touch Mac?